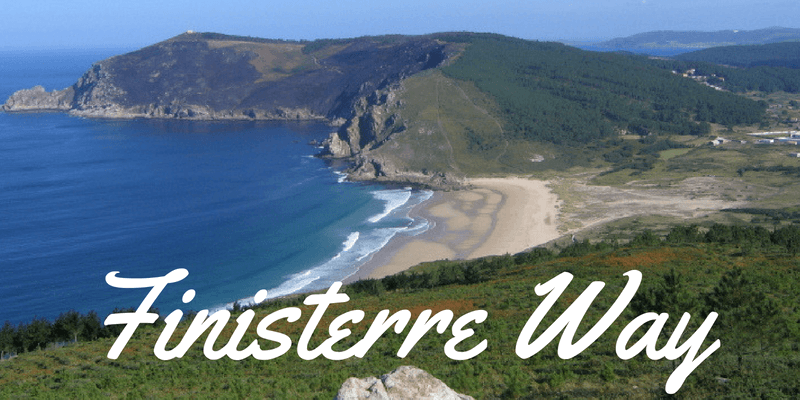 Finisterre – Fisterra in the local Gallego – from the Latin finis terrae for the end of the earth. Finisterre, forever the land of endings and death but also renewal and beginnings. Sitting on the promontory of Cape Finisterre with its stony cliffs and battering waves, it maintains a mythical presence, a phoenix springing into something new with each age. Who were the first people to gaze from its headland? Before the Catholic Church and the Camino de Santiago, before Saint James in his stone boat coming to Galicia to convert the pagans, before the Romans with their mighty armies and gods of birth and death and transformation. From Neolithic man to the early Celts, people followed the Milky Way westward to the sea. And with them they carried their gods and practices which shaped this place. History is long at Finisterre. A large village had already been built by 1000 B.C. on Monte Facho, the mountain of Cape Finisterre. From the 6th to the 1st century B.C., the Celts constructed a castro or fort on Monte Facho. On this headland the ancient Celts made offerings and performed rituals at the Ara Solis, altar of the sun. Here also was the tomb of the Celtic crone-goddess Orcabella, she the hag with the “remarkable sexual appetite”. In the Christian 5th century A.D., San Guillerme or Saint William lived in a hermitage near Monte Facho. On a nearby rock known as Saint William’s stone sterile couples would copulate to try to conceive. The spirit of Orcabella had not abandoned Monte Facho. followed on the heels of the Celts, building their great eternal roads and carrying their gods with them. However, the Romans didn’t finally defeat the Celtic resistance in the region until 26 to 19 B.C. To this conquered land, they added a shrine to the Roman Gallaecian diety Berobreus, god of the Otherworld and beyond. This shrine was present on Cape Finisterre from the 2nd to the 4th centuries A.D., overlapping with the Christian message which was spread in the footsteps of Saint James. However, the subsequent Christianisation of Iberia never entirely usurped but rather mingled with earlier Roman and Celtic pagan beliefs. Following the Romans came various waves of influence. Germanic barbarians, Vandals, Alans, and Suebi, invaded Spain, the Suebi settling Roman Gallaecia. The Visogoths reconquered Iberia and were subsequently defeated by the Moors who annexed much of Iberia. However, resistance in the northern mountains of Gallaecia meant a limited influence of Islamic culture and the survival of the Visogoth states and Christian Iberia. The reconquest of Spain by the Catholic church ushered in the great era of medieval pilgrimage to Santiago de Compostela. Finisterre was where the devout pilgrims to Santiago came to collect the proof of their pilgrimage in the form of the scallop shell. This Medieval Finisterre was also the end of the known world where the sun set into the mare tenebrosum or dark sea, still echoing its links to the Otherworld. 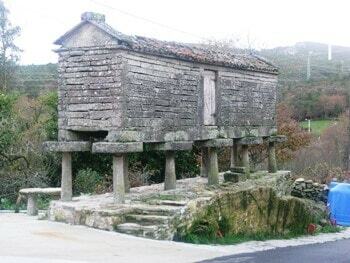 Finisterre is tied inextricably to its maritime past. It has been a stopping point since the time of Phoenician sailors and early trade with the New World. During this time, it’s reputation for savage winter storms, dense fogs, and dangerous currents became well established. In addition, Cape Finisterre itself extends perilously from mainland like the beckoning fingers of the grim reaper into the North Atlantic . The invincible Spanish Armada sailed out of Lisbon en route to Brest with its 80 ships only to lose 25 ships and 2,000 men during a ferocious storm off Finisterre on the night of the 28th October 1596. The HMS Captain lost to sea along with 500 of her men in 1870. Finisterre, always and still the shelter of harbour on the Coast of Death, calling ships to port among the skeletons of their kin. At the tail end of this history is present-day Finisterre, a small fishing port of about 3,000 residents. Around its harbour crowd the homes, tourist facilities, shops, restaurants, and beaches of the bustling town. 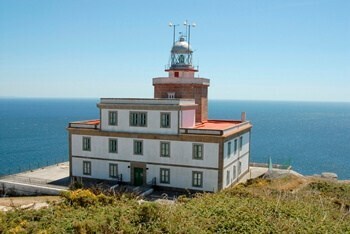 All have been anchored, for the past 163 years by the 17m tall lighthouse at the headland of Cape Finisterre. Fishing fleets come and go, unloading cargo. Tourists take cruises to the end of the cape on sunny days and dine on pescados y mariscos, the fresh fish and seafood of these waters. Visitors search out the remains of the walls, buildings, and moat built by early Celts. Pilgrims arrive by foot or by bus to Finisterre, little sister to Santiago, secondary destination for a small percentage of pilgrims. Those walking receive their Fisterana, the certificate of completion of this final leg of the ancient journey to the sea. Such is modern day Finisterre. 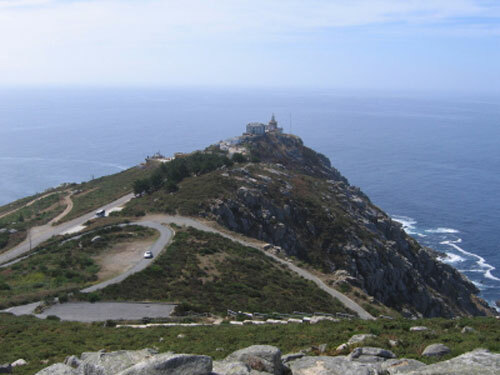 But Finisterre no longer remains the westernmost point of the known world or even the westernmost point of continental Europe. 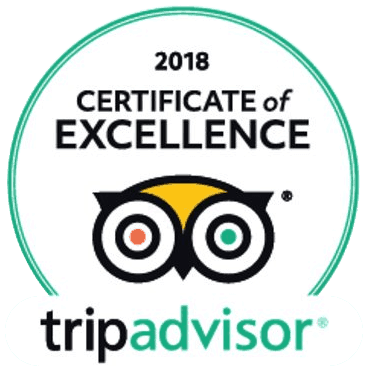 This distinction is held by Portugal’s Cabo da Roca which sits approximately 16.5 km further west. Yet Finisterre retains its mystery and its legacy as a place of endings and, paradoxically, of new beginnings. Armies and peasants, merchants and pilgrims have walked the path to its shores. And this ancient route still sleepwalks through our DNA, calling to us back to itself. A sonorous voice like the old BBC shipping forecast in the barely-awake half dawn, “South Finisterre, northerly, 4 or 5, fair, moderate or good.” Calling us to the Costa da Morte. Coast of Death. Death always calls, doesn’t it? But we suffer – or are liberated by – a thousand small deaths in our lifetimes. And so we walk and we let go, we jettison, we exhale. We walk from Sarria or Lisbon or San Jean Pied de Port or Amsterdam and we shed our carapaces. With our shiny, tender flesh exposed to the sun and the air and the healing salt water, we reach the end and begin again.